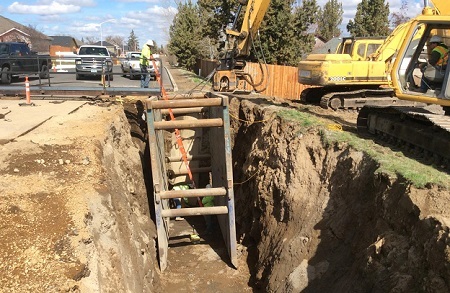 REDMOND, OR -- Crews are nearly finished installing a large sewer line in northwest Redmond, to accommodate the exponential growth expected in the area over the next couple of years. Steve Wilson, a Civil Engineer with the city of Redmond, tells KBND News, "This project replaces a pump station that was at Spruce Avenue that served the parcels that are adjacent to 19th Street, but it didn’t have capacity nor flow depth to serve anything beyond that point." That means the old pump station could not have handled the more than 500 new housing units now in development on 77 acres near NW Spruce and Northwest Way. Wilson says the new Far West Interceptor corrects that issue, "This particular piece does serve a very large portion of land. There’s a sewer master plan that breaks things down where different basins will go in the future. As each section develops farther and farther to the west and to the east, these areas are collected by new infrastructure. He says the work was complicated by the geology of the area. Crews had to bore through the rock wall on the north end of the Dry Canyon, to connect the line to the waste water treatment plant. "There’s all sorts of things that you just cannot see until you’re actually doing the boring. In this particular case, there was a lot of unique geology, but our borer did a really, really good job working with that geology to get us a fairly good alignment." The pipe was installed Friday and tested Monday morning; Wilson says it passed inspection "with flying colors." The Far West Interceptor is expected to come on line in the next three to four weeks.